Ryan McKenna didn't even expect to be here. Coming off a breakout regular season -- one in which he led the Carolina League in almost every major hitting category at one point -- the Orioles' No. 12 prospect was working on adding second base to the outfield in his defensive repertoire at instructs and expected that to be the point of focus heading into his fourth professional offseason. Instead, he found out it'd be a bit longer before that offseason begins in earnest. "It was actually a little later than most players find out, something like around Sept. 30," McKenna said. "And Oct. 3, we were shipping out. I'm a guy who will seize any opportunity they'll give me, so here I am." That opportunity was to play in the Arizona Fall League, and after nearly a month in the showcase circuit, McKenna is making the most of his chances. As of Thursday, he's hitting .373/.484/.647 with nine extra-base hits and 10 walks in 13 games with Glendale, and plenty are taking notice. The 21-year-old, who has started each of his games in center field while the second base experiment gets put on pause, won the AFL Final 2 Vote to represent the West Division in Saturday's Fall Stars Game. "It's just a blessing," the native of Maine said. "We've got a great fanbase in Baltimore, and the support they've shown me has been great. I know I've got a lot of people in my corner, including my trainer and all my family and friends and people back home who have been reaching out saying they voted. It's been a wild week." A wild season, more like. But its foundation was laid long before McKenna's recent autumnal play. The 5-foot-11 outfielder put himself on the map at St. Thomas Aquinas High , a prep school in Dover, New Hampshire, across the border from his home state. Baltimore saw enough in him up there to take him in the fourth round of the 2015 Draft. Hailing from a cold-weather region where full-season baseball was far from the norm, McKenna was put on the slow path through the O's system, hitting the Gulf Coast League in 2015, Class A Short Season Aberdeen in 2016 and Class A Delmarva in 2017. The right-handed hitter showed offensive potential, but that derived mostly from his plus speed (as exhibited by his 20 steals in the South Atlantic League). He hadn't produced an average above .265 or an OPS above .712 in those first three seasons. He entered 2018 on the outside looking in at MLB.com's ranking of top 30 Orioles prospects. But McKenna always understood he'd have more of a project on his hands than most when it came to getting accustomed to the pro game. He never tried to force the issue. "Coming off a transitional year, playing at a high level for what was my first full season, I tried coming into last offseason focusing on staying positive throughout the full year," he said. "I wanted to work on being disciplined with my mentality, because that can be tough for a full 140 games. So I really wanted to come into Spring Training knowing that I could do this, knowing what it's like and keeping that positivity all the way through." But for all his attentiveness on the mental portions of the game, McKenna didn't shy away from the physical part. The New Englander takes pride in his fitness and strength training, especially for someone his size, and has always kept an eye out for potential adjustments at the plate, even going so far as finding one on television last offseason. "I've actually started a toe tap that I picked up from watching Chipper Jones talk about it on MLB Network," said the O's prospect. "I really liked the mindset he was describing that it got him in, that it allowed him to be aggressive up there. My dad even asked, 'Why don't you do that, then?' So I tried implementing it myself and ended up really liking it." It didn't take long for the results to show. Starting the 2018 season at Class A Advanced Frederick, McKenna got better with each passing month during his time with the Keys, hitting .326/.417/.427 in April, .397/.470/.586 in May and finally .423/.538/.712 in June. By the time he was promoted to Double-A Bowie on June 21 -- two days after batting leadoff in the Carolina League All-Star Game -- he had led all Class A Advanced hitters in average (.377), on-base percentage (.467), hits (97) and total bases (143) over his 67-game stay at the level. His 192 wRC+ finished the season highest among Class A Advanced hitters with at least 300 plate appearances, and it wasn't close. Bobby Dalbec of the Red Sox system was second in the same group, at 161. Part of that dropoff came from seeing more experienced arms, but McKenna also readily admits that he's still on a different acclimation timeline than prospects from warm-weather states like Texas, California or Florida. "The difference shows up a good amount, I'd say," McKenna said. "I know I've been given gifts. Some of mine are the plus abilities I have on a baseball field that made me deserving of a spot out here in the first place. But it's just different. You see others out here have that experience portion of the game down, and they may not make as many mistakes as some of the inexperienced players. I think I've done a good job of developing myself and getting ready for a long season, but the experience factor is huge. The only way to change it is, you have to work on it." That was likely part of what the Orioles had in mind by sending McKenna late to the Fall League, allowing him to get more at-bats, more reps to make up the gap between him and other players he'll see upon his return to Bowie in 2019. Having jumped into the top half of the O's system rankings, he's carving out a big role for himself on the Baltimore farm, thanks to his offensive improvements. It couldn't come at a better time, with the organization in an obvious state of transition while it awaits a new general manager and Major League skipper. The Orioles kicked their rebuild into overdrive this season, as McKenna saw first-hand when he was Baysox teammates with newly acquired prospects like Yusniel Diaz, Dillon Tate and Dean Kremer. 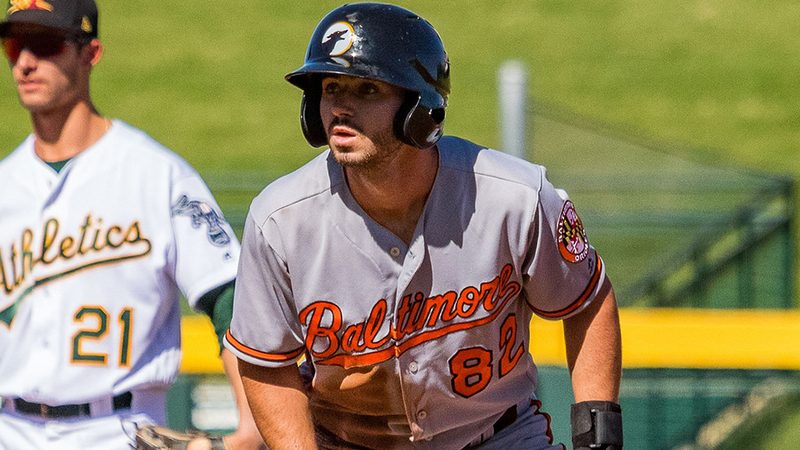 Fans showed their excitement for McKenna's impending role in the new era of Baltimore baseball by voting him into Saturday's Fall Stars Game, and whether it's in center field or at second base, McKenna is determined to repay them in the Majors. "I know the Orioles like me, and I definitely enjoy playing here," he said. "They've invested in me coming out [to the Fall League]. This is what the goal is and has always been -- make small strides to eventually make an impact up there. I'm not done. I've got to keep developing, but what I want is to be part of the next World Series team for Baltimore, and that's what we're all working toward."